It’s been yet one more summer of anomalous weather events resulting from human-caused warming. Massive floods have spanned the globe, shattering records that have stood for 50, 100, or even 500 years. In other regions, record droughts and heatwaves have resulted in thousands of heat injuries and hundreds of deaths with the southeast Asian heat dome alone reported to have hospitalized tens of thousands and resulted in at least 100 deaths in China, Japan and Korea. These droughts and heatwaves created hazardous water shortages putting communities from the American Southwest to Eastern China at risk of severe damage and loss of ability to supply growing water demands. They also sparked massive and freakish wildfire complexes that damaged or destroyed hundreds of buildings or left enormous burn scars over landscapes from tropical regions to the Arctic tundra — some of which have now born the excessive insults of major fires for ten years running. The term Arctic heatwave has become common parlance. And the combination of extreme weather has resulted in widespread damage to crops and related livestock industries. All these extreme events, in concert, are visible proofs of a climate emergency that is just starting to ramp up. Few have received the attention they warrant in the mainstream press — either singly, or together as an overall dangerous alteration to the world’s climate and weather. But of all these, rather ominous, events, one stands out as a warning of a new, out of context, threat — a set of freakish floods in the Himalayan highlands. Floods set off by a combination of high altitude rainfall and the collapse of damns formed around growing glacial melt lakes in a region undergoing very rapid melt and warming. Since the early 2000s, average temperatures in the Himalayan Mountains in northern India have increased by about 1 degree Celsius, around 4 times the global average. This steady temperature rise has resulted in a gradually increasing melt of the massive glaciers along this major mountain chain featuring the tallest peaks in the world. Over the past decade, immense glaciers along this range have witnessed unprecedented melt with many glaciers losing up to 30% of their mass. Predictions show total melt for most glaciers likely to occur under current rates of warming and fossil fuel emission by around the end of this century. The massive and unprecedented rate of melt has fueled the formation of numerous very large and growing glacial melt lakes throughout the Himalayan region. So far, about 200 of these amazing 20,000 melt lakes have outburst in flood events that are a direct result of human caused warming and related glacial melt in the Himalayas. One such melt lake developed and filled over the past few years in a region just 4 kilometers to the north of the Indian village of Kedarnath. It was just one of the hundreds of newly formed lakes that developed and steadily grew in size over the past five years. By June of 2013, the lake had filled to capacity. Its high altitude waters held back only by a thin damn of sediment pushed out by the now, mostly melted, glacier. Then came the rains. 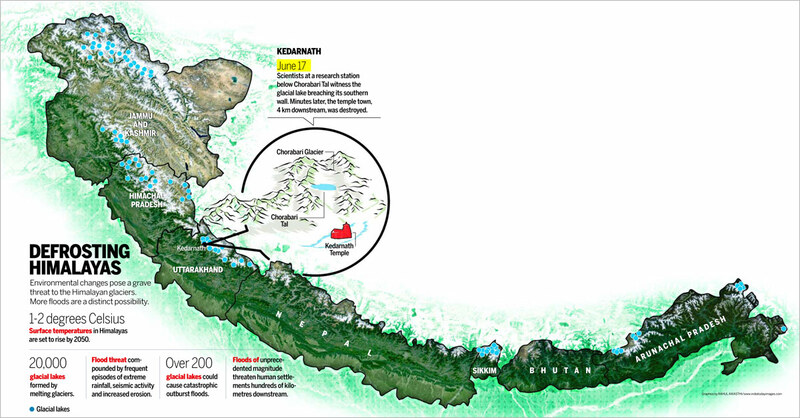 In the days leading up to June 17, a massive rainfall event inundated the Kedarnath region, spilling waters into an already over-filled glacial melt lake north of Kedarnath. By June 17, a tipping point was reached and the sediment damn holding back the brimming glacial melt waters erupted, unleashing what amounted to a mountain tidal wave upon Kedarnath and a massive area stretching 40 miles downstream from the glacial outburst. This immense flood swept away more than 6,000 people who are now presumed dead after one of the worst flood events in Indian history, an event that would almost certainly have never happened without human-caused warming. “The Kedarnath floods may be only a small precursor to never-seen-before mega floods,” says Maharaj K. Pandit, director, Centre for Inter-disciplinary Studies of Mountain & Hill Environment, Delhi University. Scientists like him believe that the high precipitation on June 16 rapidly filled up Chorabari Tal, a glacial lake less than 4 km upstream from Kedarnath, and the continuing downpour the next morning caused the lake to overflow and possibly burst out from its loosely packed rim of moraines (glacial sediments). According to reports by Indian scientists, rainfall rates over the Himalayan mountain chain are increasing even as rates of snowfall events are falling. Overall, precipitation is increasing by 30 percent, but more and more of this greater volume of precipitation is coming down as rain. The rain provides a double stress to glaciers in that it delivers more heat to already rapidly melting ice masses and the added run-off creates large pulses that both erode ice sheets and sediment deposits that keep both ice and water locked in. Eventually, water erosion and heat stress is too great, melt rates are too high and sediment and ice damns can no longer hold. The result is a massive and very dangerous flood event called a Glacial Outburst Flood (GLOF). The Himalayans have seen increasingly severe GLOFS since 1929 when the first major such event emerged. Overall, 200 GLOFS have inundated various regions surrounding the Himalayans with major resultant damage to infrastructure and loss of human life. But with hundreds of new lakes forming over the past five years and with rates of glacial melt spiking, the risk for increasingly catastrophic GLOFS is growing. As noted above, there are currently 20,000 large melt lakes throughout the Himalayan chain and, with temperatures in the region expected to increase by another 1-2 degrees Celsius before 2050, the number and size of glacial melt lakes is bound to grow. More rainfall will occur at higher and higher elevations, pushing glacial melt lake levels higher and higher. In the end, millions of downstream residents are at increasing risk of Glacial Outburst Floods. With human climate change pushing warming at such a rapid and unprecedented rate, it is only a matter of time before more of these amazingly dangerous events take place. Global carbon emissions hit a new high in 2012 and a start to global greenhouse gas reductions, without serious and immediate global policy measures, is years to decades away. So it is highly likely that risks for large GLOFS will continue to increase in India and in other nations bordering the Himalayan mountain chain. Anywhere in the world where major ice sheets and glaciers exist, the threat of large Glacial Outburst Floods is growing. Perhaps the starkest manifestation of this risk is visible upon the now, rapidly melting, ice sheet of Greenland. Since the mid 2000s, Greenland has been melting at a rate of 500 cubic kilometers every year. And due to polar amplification, rates of temperature increase over the Greenland ice sheet have been about double the global average. A recent report published in Nature found that just another .8 degree Celsius rise in global temperature would be enough to push the Greenland ice sheet to the point of no return. In this case, a long-term melting of all the Greenland ice sheet will have been set off by human warming. But with very rapid melt starting to occur now, it is likely that we are already at the point of large-scale destabilization of the Greenland ice sheet even as we stare down the face of setting in place a total melt scenario over the next few decades (setting off a chain of chaotic events that would likely take centuries to complete). With temperatures continuing to rise over Greenland and with human greenhouse gas forcing and Earth System feedbacks also on the increase, it is highly likely that pace of ice sheet destabilization will continue to accelerate. The problem with Greenland melt, however, is in many ways far worse than the melt of the massive, though comparatively smaller, Himalayan Glaciers. The Greenland ice sheet is entirely contiguous and has massive depth and a towering elevation of two miles at its center. Glacial Outburst Flood events from such a large source will, therefore, be far, far more catastrophic. In the Greenland melt dynamic, multiple glacial melt lakes will increasingly form over the surface of the Greenland ice sheet. We can already see such events beginning during current summers. 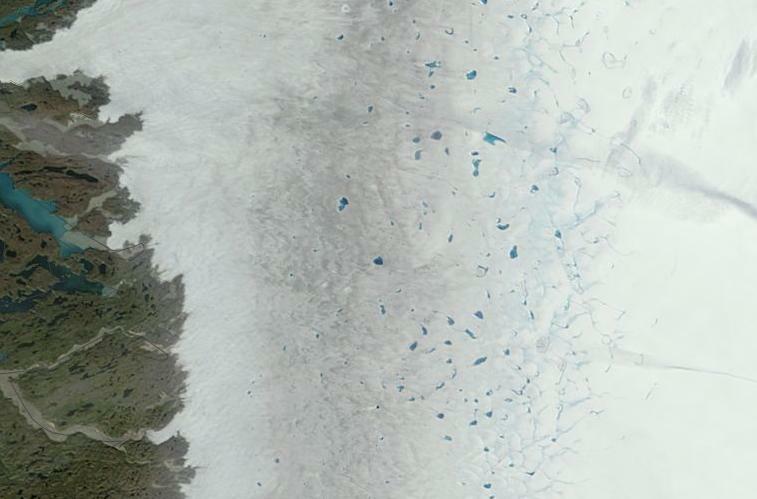 The above shot provided by NASA shows numerous melt lakes forming in the western border of the Greenland Ice Sheet on August 4 of 2013. These melt lakes are many times larger than those seen in the Himalayas with some of them stretching six kilometers in length. In the future, we can expect the size and number of the glacial melt lakes to greatly increase. With such a large region of ice covered by numerous melt lakes, a kind of ominous tipping point may be reached. During warm summer months, weather systems may pull warmth and moisture over a large section of the Greenland Ice Sheet which is already covered with numerous melt ponds. Temperatures above freezing and a constant flow of moisture emerging from the southern latitudes through a locked in place Jet Stream pattern may ensure that the rain event over these Greenland melt lakes lasts for days or weeks. Eventually, some of these melt lakes begin to over-top, spilling waters into the already filled lakes lower down on the ice sheet. These lakes then also over-top, contributing ever greater volumes of water to the growing flood. Depending on how far melt lakes penetrate into the ice sheet, this chain reaction over-topping can proceed for tens or even hundreds of kilometers. 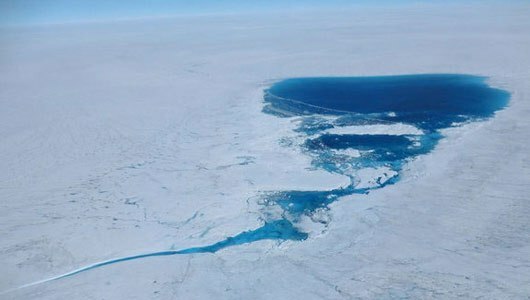 By the time the massive flood has reached the lower ice sheet edge, perhaps a kilometer or more below the initial flood source, a massive glacier-originating wave has developed, one that is, perhaps, tens or hundreds of feet in height and with a front covering tens or even hundreds of miles. Such a powerful outburst megaflood would contain both freezing water and large fragments of ice ripped from the ice sheet as the outburst wave proceeded down the ice sheet. And, like the Kedarnath megaflood, it will also likely contain boulders pulled from adjacent mountains and lands. But this particular event would be far, far worse than any Himalayan outburst flood. It would proceed for hundreds and, perhaps, thousands of miles from the outburst site, leaving a swath of destruction similar to that seen in the worst global ocean tsunami events of recent years. 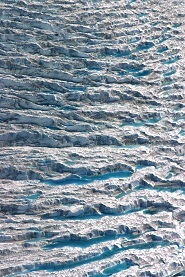 Melt Lakes Forming Among Terrace-Like Structures on the Greenland Ice Sheet. Set up for Future Large Outburst Megaflood? We see evidence of such events occurring at the end of the last ice age, with petrified trees imbedded in rock strata up to 500 feet above sea level in the cliffs and mountainsides of Pacific Islands bordering the Arctic. It is thought that these trees were carried by massive glacial outburst floods from the melting Laurentide Ice Sheet which, at the end of the last Ice Age, was thousands of miles away from this tree deposition. The trees found in these deposits are natives to Canada and Alaska and the character of their deposition is indicative of a catastrophic outburst flood event or series of events. Glacial Outburst Megafloods are among the most dangerous risks posed by rapid Greenland and West Antarctic Ice Sheet melting, warming and destabilization. And Greenland is most likely to see its first manifestations, though Antarctica may follow soon after, over the course of years or decades. Such ice sheet decline will be both chaotic and destructive — with moments of almost unthinkable outburst events proceeding once certain tipping points are reached. Some of these events may already be locked in due to current human forcing and related natural feedbacks. Let us hope that it is possible to prevent their very worst manifestations. A major outburst flood issuing from a large section of the Greenland ice sheet would render miniscule even this, very energetic event. This mega-flood scenario plays out in my sci-fi novel “The Martian Patriarch.” First, the Greenland glaciers melt faster than expected. Then, the West Antarctic ice shelves collapse in quick succession allowing the massive continental ice sheet to flow unimpeded into the sea. The unexpected surge floods coastal regions throughout the globe causing catastrophic devastation. Ocean levels rose over a few months sufficient to turn California’s central valley into a huge inland sea. Totalitarianism crushed the resulting social upheaval after a group of forward-thinking people had made their escape to Mars. I condensed the climate change timeline for dramatic effect. But after reading this post, perhaps the story wasn’t so far off after all. There is evidence of massive glacial outburst floods in the past. With the pace of human warming so fast, the tempo of such events could be exceptional. Your fiction is quite close to reality. Mine suffers similarly. 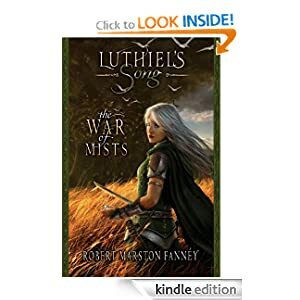 Is that the “Luthiel’s Song” series? I presume “Growth Shock” is nonfiction. When will it be published? It looks like something I’d be interested in. 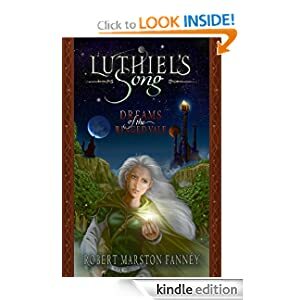 Luthiel is a metaphor for Earth (water through stone). The series promotes veganism and compassion and explores obectivism and hyper-individualism as origins for the heart of darkness. I have not read up on these floods, but read brief snippets in the Indian Press. I heard the number could be as high as 10,000 people. I watched a panel discussing this on You Tube and everyone agreed this was to a large extent a man-made disaster. I also want to thank you for your interest and likes of the articles I post on my blog. I really appreciate your readership. Thx for the heads up on numbers… I’ll check for more recent sources. more than a month’s worth of rain in a day. That’s compared to the disastrous 2009 Typhoon Ketsana, the strongest cyclone to hit Manila in modern history with 455 mm of rain in 24 hours. Has anyone seen this video of the Indian floods — whoa! That is really grim having the last few seconds of your life appear on U-tube. Yeah. I’ve seen a few of these around and decided to keep them out of main posts out of respect for the dead and lost. “That fire is now closer to 20,000 acres and we are having hot dry (14% humidity today) winds ( 25 mph.) today. Last week we had an odd occurance. We have glaciers here in Wy. and last week a glacial lake that had formed because of higher tempertures, collapsed and sent 3 feet of water down the mountain and through an outfitters camp stranding people for a while. This is the second time this has happened in the last few years. I live in a high mountain desert and we count on water from the glaciers for some of our water supply but not in this way! I see a China/Russia type flare up over this. The amount of water that Las Vegas uses is staggering. With solid evidence that major water shortages are in the near future, will people actually remain silent and let Vegas maintain status quo? I wonder what type of effect losing one of their two water intakes would have if they aren’t able to make the third one like they want. I can’t imagine them getting approval to do so either if that is required by law which I assume it is. Sin City will probably need to start shutting down those fountains and emptying those terraformed lakes and massive swimming pools. Fracking anywhere in the American Southwest is a bad idea for a host of reasons ranging from amplifying the pace of southwestern drying to harming and overusing already stretched water supplies. To survive the next two decades these southwestern cities will require extreme creativity and probable rationing of water supplies. After two decades, I don’t know if those communities will exist. It’s an irony, but the people there, many of whom seem so averse to immigration, are increasingly likely to become climate refugees themselves. The communities there simply cannot exist without water. And the sources are steadily, inexorably drying out. Drought Called a Factor in Syria’s Uprising. Two-and-a-half years ago, a group of children in the Syrian city of Dara’a triggered one of the bloodiest conflicts in the 21st century when they painted some anti-government graffiti on a school wall in the ancient farming community. The children were quickly detained and tortured, leading to widespread protests in the city that were met with harsh repression. The government’s brutal response led to a nationwide revolt that has now stagnated into a bloody stalemate with no end in sight. Dara’a is a mostly agricultural community in a region that has suffered an unrelenting drought since 2001. Some experts say it’s no accident that Syria’s civil war began there. Exploration for resources in northern Canada has created a dense network of linear disturbance such as winter roads and seismic lines. Now a team from Wilfrid Laurier University, Canada, has found that these disturbances have severely altered hydrology, ecology and ground thermal regime in a region of discontinuous permafrost. What’s more, the permafrost does not regenerate. Using indicator molecules, a team of researchers headed by ETH Zurich has demonstrated that carbon stored in the Arctic permafrost is being mobilized in Eurasian river basins. Arctic permafrost soils store vast amounts of carbon in the form of dead but not decomposed plant debris. Around half of the global soil carbon reservoir is stored in these permanently frozen Arctic soils. Through global warming, however, the permafrost is thawing to increasing depths, which may mobilize the carbon stored within. The amount of water drainage from rivers such as the Yenisey and the Ob in Siberia or the Kalixälven in Northern Sweden, which drain vast land areas, has also changed. Due, among other things, to a changing precipitation regime, these rivers are conducting more water away into the seas than a few decades ago, also transporting the carbon from their basins towards the sea. The main concern for scientists is that the activity of microbes or other organisms that live off organic matter and exhale CO2 could cause carbon that has been stored for thousands of years to get back into the atmosphere – and in a big way.